Some kids want to grow up to be train conductors, while others want to become train engineers. 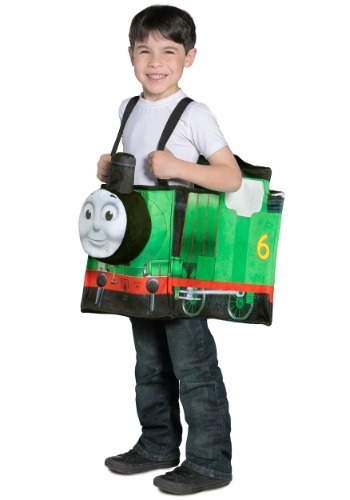 Does your little one want to grow up to be an actual train?? Now, they can look like one of their favorite trains from the Thomas series when they take a spin in this Percy Ride in Train costume! All of the hustle and bustle going on around Sir Topham Hatt's trainyard can be an exciting thing to see. With so many railcars and trains needing to get from one place to another, it seems like the action never slows down. Of course, Percy the Small Engine wouldn’t have it any other way, and loves proving to the bigger engines that he can work just as hard as they can. Since he's the youngest engine in the fleet, Percy has a lot of expectations to live up to. But, as Thomas's best friend and an all-around very pleasant engine, he has no shortage of help if he needs it. Since Percy and his friends are always learning new things about working together as a team, he's a great little train for your own little one to play as! They will have lots of fun playing in this costume, pretending the backyard is their own railyard. The engine-shaped tunic hangs by adjustable straps and is printed with the image of Percy, with the 3D boiler and chimney sections sticking out in the front. It's an adorable look for when they are playing trains by themselves, or with other little ones dressed as Percy's engine friends!